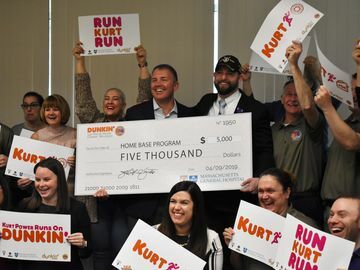 As fans from around the country look forward to the exciting game in Indy this weekend, Dunkin’ Donuts’ Boston, Metro New York and Indianapolis markets have been busy celebrating and keeping fans running. 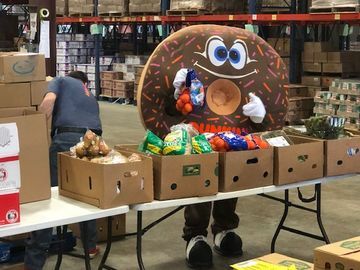 From special donuts, to extended hours, contests and send-off events, read more about what we’ve been up to in advance of the big weekenDD! Some of the special donuts and ice cream cakes spotteDD in Boston and Metro NY. Given Dunkin’ Donuts’ rich history in Massachusetts – our first restaurant opened in Quincy, Massachusetts in 1950 – it’s no surprise that many New England Patriots fans are running on Dunkin’! Over the past week, we’ve seen colorful donuts celebrating the Patriots pop up in Dunkin’ Donuts restaurants around Metro Boston. Our Boston team also offered fans the chance to win the trip of a lifetime – a pair of tickets to cheer on the New England Patriots in Indianapolis! On Sunday, January 29, during the official Patriots send-off event at Gillette Stadium, fans were invited to the Dunkin’ Donuts truck located outside the Patriot Place Gate from 9:30-11:30 a.m. to enter for a chance to win a five day, four night trip to Indianapolis including flight, hotel and two tickets to game. The winner, Francis of Wareham, MA, was selected at random and is thrilled for the opportunity to cheer on his favorite team in Indy! We hearDD our winner Francis, of Wareham, MA, loves the Pats so much, he has a Patriots tattoo! According to Dunkin’ Donuts’ Senior Field Marketing Manager, Missy Maio, the brand’s Metro NY guests, “Couldn’t be more excited to cheer on the New York Giants this weekend.” So, to celebrate a magical season, Dunkin’ Donuts hosted a special send-off party for New York Giants kicking heroes Lawrence Tynes and Steve Weatherford on Sunday, January 29. An estimated crowd of over 1,000 people (some as early as 2:30 a.m.!) came to a Dunkin’ Donuts restaurant in Midland Park, New Jersey, to take part in the event. Fans were treated to a meet and greet autograph session with the players and sampled special Giants-themed donuts during the festivities. Lawrence Tynes and Steve Weatherford signing autographs. “It’s always a lot of fun when our New York area teams do well. To have the Giants in the Super Bowl is not only exciting for the fans, but it also brings great energy to all of our restaurants. The event with Lawrence Tynes and Steve Weatherford was a great way to send off our football heroes as they get ready for the big game,” added Maio. 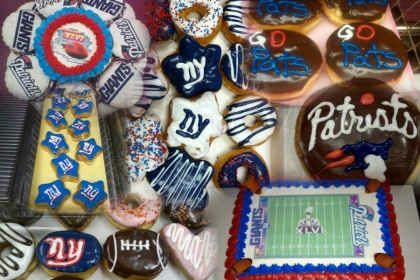 In addition to special Giants-themed donuts, participating Metro New York Dunkin’ Donuts and Baskin-Robbins combo shops have also been offering fans the perfect gameday cake. Check it out! 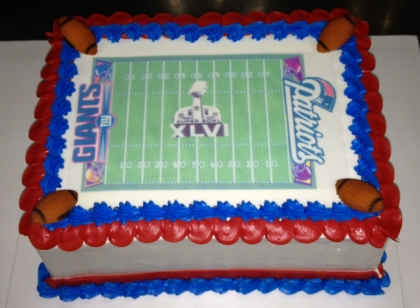 Baskin-Robbins New York Giants & New England Patriots themed ice cream cake, available at participating Metro New York shops. Hey Indy, What Are You Drinkin’? Special Indy billboards posted arounDD the city. Of Rick’s two shops, the busier of the two (125 S. Pennsylvania Ave.) is located in the village area near the stadium, a part of town that will be closed off to cars all weekend. Luckily, the restaurant has a walk-up window, which has been really popular with guests. “We’re not surprised to see a constant stream of people here throughout the day and know it’s going to get busier this weekend as more fans come into town,” he said. As a result, Rick and his team are going to offer extended hours in both restaurants. The 125 S. Pennsylvania Ave. restaurant is going to be open 24/7 from Thursday, February 2 – Sunday, February 5. The nearby 48 E. Washington St. Location (less than two blocks away), will be open until 3:00 a.m. nightly from Thursday through Saturday and until 1:00 a.m. on Sunday. 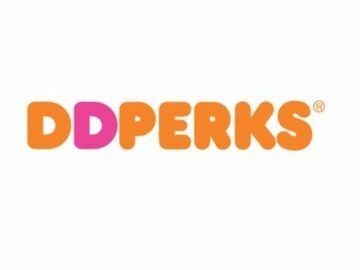 In addition, a Dunkin’ Donuts street team in Indy is going to hand out coupons for a free travel mug while supplies last. In total, they hope to give away 3,000 mugs to keep fans going. In addition to the excitement in our Indy restaurants, we heard that Dunkin’ Donuts is also going to help keep the ESPN The Magazine's NEXT Party running with coffee, hot chocolate and Munchkins® donut hole treats. Stay tuneDD for behind-the-scenes deets from this event as we get the ‘scoop’ from our team next week! Who’s reaDDy for some football? !